Wednesday, October 6, 2010, 6:30 p.m. – 8:30 p.m.
We meet at the Firehouse Center for the Visual Arts, located to the right of City Hall on Church Street in Burlington, VT.
Punch in the code (contact us for code). When the green light glows, pull open the door. Elizabeth Rideout will give a short talk and leather demonstration on full leather bookbinding using the Single Flexible Binding as example. A variety of tools and materials used in the process of leather bookbinding will be shown and described. The step by step process of true binding with laced on boards will be reviewed as well as the nature of working with leather. Samples of the Single Flexible binding at different stages in the process will be shown and a demonstration of covering a book with leather, a wet process, will be done. Our September meeting was filled with an enthusiastic crowd that marveled at the possibilities of miniature books. First off, Elizabeth Rideout presented information about our spring show, Big Ideas – Small Books. As our minds were questioning how we could go about making miniature books, Nancy Stone presented an ingenious method of using units for making origami books to fit any container. She also shared books made by some of her students. Our final challenge of the evening was making a delightful miniature cloth book with tiny pages and a wrap around snapped cover. Liz Kappel designed this book and generously made kits for all of us. We just had to sew tiny stitches and follow Liz’s lead and we all ended up with beautiful tiny quilted books that can be worn as a necklace. Liz also presented some of her fabulous cloth books. We were in awe of her creative spirit and her beautiful books. Elissa Campbell created a booklet with resources on miniature books, which you can download here (print it back-to-back). She’ll also have copies of the booklet at the October meeting. B.A.G. members were treated to a fantastic weekend when Peter and Donna Thomas came to Vermont at the end of August. 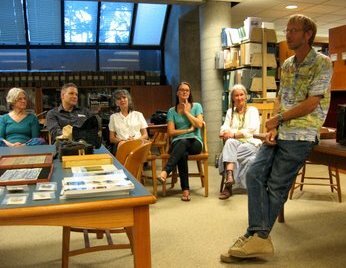 On a Friday evening, Peter and Donna’s lecture The Literary Book as a Work of Art was presented to a full audience at UVM Special Collections. The following day, Peter and Donna taught their workshop The Nested Accordion Pop-Up Book and the Miniature Scrolling Book to 12 lucky attendees. Peter and Donna started their cross-country, book arts adventure in April 2010. You can read more about Peter and Donna’s journey on their blog, Adventures of the Wandering Book Artists. We are thrilled that we were included as a stop during tour. You can view images from both the lecture and the workshop on the B.A.G. blog. *** Judy Sgantas has her work 4 and 20 included in 23 Sandy Gallery’s Pop-Up Now!, a juried exhibition of handmade movable artist books. Jill Timm, one of our recent workshop instructors, was one of the three jurors. You can view the exhibition catalog online. 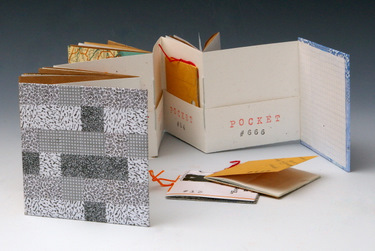 23 Sandy Gallery, located in Portland, OR, has a strong interest in presenting work in book arts. The exhibition runs from September 22 – October 30, 2010. *** Elizabeth Rideout and Jill Abilock will be participating in Thirteen Artists in a Big Red Barn, an open studio event on October 16th. In addition to visiting the artists, you can also enjoy food, music, and wine tasting. The event is open from 10:00 a.m. – 7:00 p.m. on 1260 Pond Road, Shelburne, VT.
For more information, contact Kathy Stockman at (802) 999-4394. *** Elizabeth Rideout is teaching two upcoming classes at Shelburne Craft School. In Coptic with Wooden Boards, students will learn one of the oldest book forms in history, using a four needle, across the spine sewing technique. The class meets on October 9, 2010, 10:00 a.m. – 4:00 p.m. In the 3-day workshop Miniature Book Ornaments in Leather, students will learn basic leather work technique and assemble two full leather miniature books. No previous experience required. The class meets on November 13, 20, and December 4, 2010, 10:00 a.m. – 2:00 p.m.
You can register for a class online or call (802) 985-3648 for more information. *** The Eliot School in Jamaica Plain, MA is offering a number of book arts classes now through Spring 2011. Upcoming classes include Mixed Media Artists’ Books and Asian Stab Binding. Click here to download the complete catalog. *** Elissa Campbell is teaching The Recycled Accordion Book at Studio Place Arts on October 19, 2010. In the workshop, you’ll create an accordion book using recycled papers, books, and other found materials. No experience necessary. *** Last month we learned that Richard Langdell sold his handmade paper business. Lucky for us, his inventory has stayed behind. Richard will be participating in the Vermont North by Hand Open Studios on October 2 & 3, 10:00 a.m. – 5:00 p.m. This is a great opportunity to pick up that paper you’ve always wanted. While you’re there, you can ogle the fabulous fiber work of Richard’s wife Sarah, Mistress of Mountain Ash Design. If you can’t make it to Richard’s studio, you can also buy his paper on Etsy. *** The Book Unbound & The Book Arts at Dartmouth is currently on display now through November 24th in Baker Main Hall at the Baker-Berry Library, Dartmouth College. The exhibit highlights the book and the book arts at Dartmouth and was curated by Stephanie Wolff and Deborah Howe, both staff of Dartmouth College Library Preservation Services. Dartmouth College is in Hanover, NH. *** On Thursday, October 21st, Dominic Riley will be the featured artist at a lecture co-sponsored by The New England Chapter of the Guild of Book Workers and the North Bennet Street School. Dominic is Vice Chairman of the Society of Bookbinders and was elected a Fellow of Designer Bookbinders in 2008. The lecture is from 6:00 p.m. – 8:00 p.m. at the North Bennet Street School in Boston, MA. This lecture is free and open to the public, but seating is limited. Please contact the NBSS to reserve a seat. *** The North Bennet Street School is having their 18th Annual Open House on November 5 & 6, 2010. You’ll have the opportunity to see work in progress and visit with bookbinding instructors and students. They also have a gallery where you can buy specialized hand tools. For more information about the Open House, please visit their website.